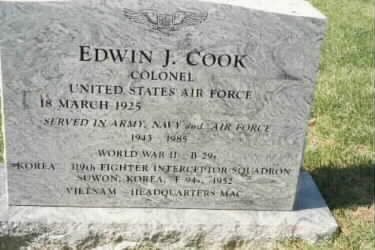 Retired Air Force Lieutenant Colonel Elvera E. Cook, age 65, died on August 26, 1991, of breast cancer at Walter Reed Army Medical Center. Served in the Army as a civilian before joining the United States Air Force in 1952. She worked at Letterman Army Medical Center, San Francisco, in late 1940s. She transferred to Unzen, Japan, 1949, and also served in Nagasaki. In 1950, she transferred to Fuji View hotel near Tokyo. With the outbreak of Korean War, she volunteered as casualty nurse at Osaka Army Hospital, Japan. She then returned stateside and joined the Air Force. 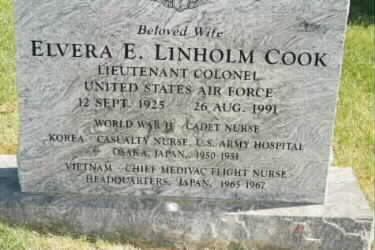 From 1965 to 1967 she served as chief nurse of Aeromedical Evacuation from Vietnam. She retired from active duty in 1972 after serving 20 years. Burial in Arlington National Cemetery on September 4, 1991.